Paul Glee Waner played baseball in the big leagues for 20 seasons, from 1926 to 1945. They called him “Big Poison” despite Waner being a small man at 5 ft. 8 1/2 in. in height and never weighing more than 153 pounds. Despite his somewhat diminutive stature and the fact that he thought that he played better slightly drunk or hungover, Paul was a superb hitter. Why did he think drinking helped him? “Paul thought you played better when you were relaxed, and alcohol was a good way to relax”, explained his kid brother, Lloyd. There may have been something to his theory on drinking and playing as in the 1938 season, management made him give up drinking… he proceeded to post his lowest batting average of his career, hitting .280, over 60 points off his career average at that point and 74 points off what he hit the year before. This doesn’t exactly paint the picture of someone who you’d expect to have been one of the game’s greatest hitters, but Waner went on to accumulate 3,152 hits, collecting over 200 hits in a season 8 times and leading the league in batting average 3 times. He also had a lifetime batting average of.333. Besides hitting, he was extremely fast and was known for having a cannon for an arm, including leading the league in outfield assists one season with 31. Anyway, let’s get back to our original question- why would anyone refuse a base hit? It was 1942. After playing a majority of his career for the Pittsburgh Pirates, Waner was on the tail end of his career, playing for the Boston Braves. He had accumulated 2,999 hits up to this game and was shooting for number 3,000. At this point in history, only 5 players had ever gotten 3,000 hits- so this was to be a historic occasion. At the time, Tommy Holmes was on first when a hit and run was put on. This pulled the shortstop Eddie Joost out of position and Waner managed to hit the ball right where the shortstop would have been, had he not been moving to cover second. Unfortunately, Joost was able to dive back into position in time to get his glove on the ball, but had no play at first. As you would expect from such a play, the official scorer decided to award Waner with a hit- number 3,000. The crowd, of course, cheered wildly. 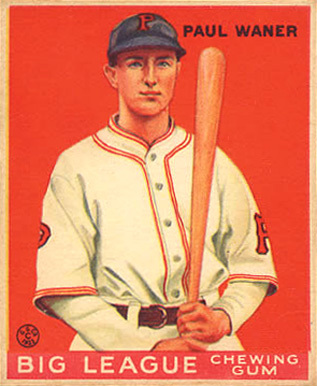 But then Paul Waner did something no baseball player has ever done- before or since. He yelled up at the press box “No, no, no!” wanting the hit removed. When the scorer got the message, he went ahead and changed it to an error on the shortstop. So, with this new ruling, Paul still sat at 2,999 hits. Two days later on June 19th, while playing against the team he’d played for most of his career, Pittsburgh, Waner singled sharply to left field off of Rip Sewell giving him a “clean” 3000th hit. While it may seem odd to us today, this was actually one of the first times in Major League Baseball history that the general public paid significant attention to a personal milestone of a player while it was happening. It also was the first time people started really thinking about the “3000 hit club” and those players who’d reach that mark being special compared to say, Sam Rice, who had 2,987 hits and saw no problem with retiring without getting the extra 13 necessary to reach 3,000, as at that point (in 1934, his last season) hitting a special milestone like 3,000 hits just wasn’t a big deal. Waner’s march towards 3,000th hits and Lefty Grove’s 300th win a year earlier started to change that and from that point on, major milestones like 300 wins, 3000 hits, and baseball starting to pay attention to its own history started to become an integral part of the game- something that has only become more engrained as time has gone on. Waner had an unusual way of sobering up before a game- he’d do back flips in the outfield. Along with his brother, Lloyd “Little Poison” Waner, the two collected a record 5,611 hits- the most ever by two brothers to date. Second place on the list of most hits by brothers currently goes to the Alou brothers Felipe, Matty, and Jesus, who combined accumulated 5,094 hits. Waner had an interesting trick he’d occasionally use against pitchers, which he claimed was effective, though is impossible for us to track to verify. Sometimes when it didn’t matter and he got a pitch he’d otherwise have been able to square up, he’d purposefully swing and miss and try to look completely fooled on the pitch in the process. He might even do this multiple times. Naturally, the pitcher would note this and keep it in his arsenal for when he’d really need to get Waner out. When that time came, Waner would then have a good idea what was coming and make sure it was a pitch he could hit.